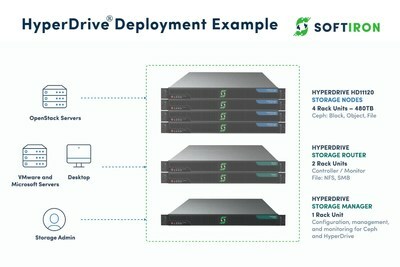 RUST, Germany, March 26, 2019 /PRNewswire/ -- Silicon Valley- and London-based enterprise storage startup, SoftIron, announced today that they are launching their highly-anticipated HyperDrive® Storage Manager, promising to radically simplify the management of Ceph software and storage hardware. Ceph is widely considered to be the leading open-source software that underpins enterprise level software-defined storage (SDS) solutions. Whilst Ceph is undoubtedly powerful, it is also incredibly complex, requiring specialist technicians to deploy and manage the software. This complexity has inhibited the true potential of Ceph and has been an obstacle for Ceph deployment for many organisations. 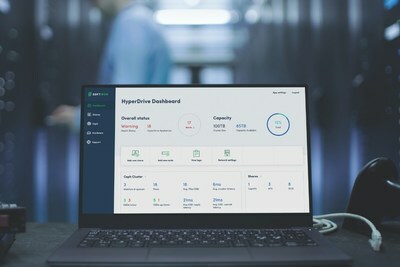 "We've always been committed to making software-defined storage simple, and so we're thrilled to finally bring Storage Manager to the SDS and Ceph community. Customers have been asking for something like this for a while now, and we've spent a great deal of time working with them and leading Ceph experts to deliver it. It really is the first of its kind and is going to make this powerful technology so much more accessible" says Tim Massey, CEO of SoftIron. Tim says "We know we've solved a huge problem for the industry; this is going to revolutionise the way in which organisations administer their data storage by creating better transparency and alleviating technician expertise for more worthwhile projects, thus saving time and money. We're really proud of the team and look forward to the feedback."